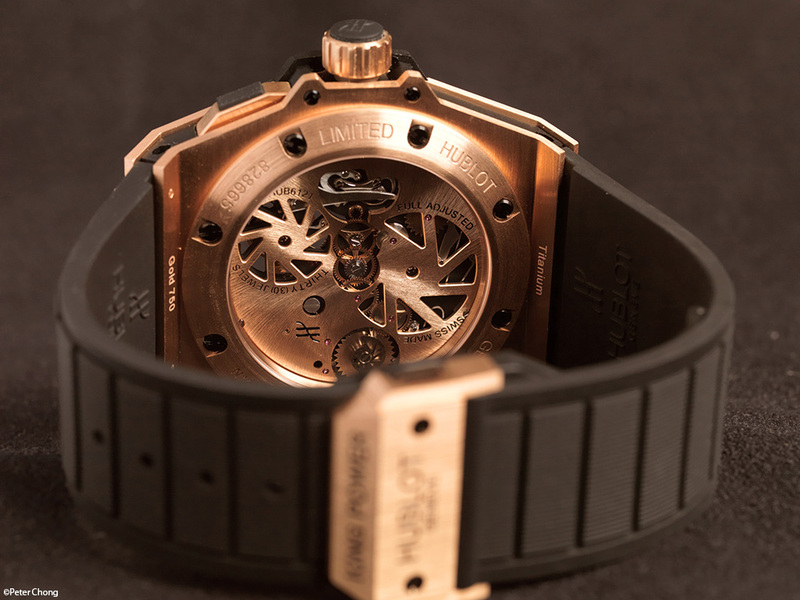 Hublot is an amazing company...in the early days, they pushed innovation with scented rubber straps...which even today, is an interesting concept. But since Jean Claude Biver, the marketing supermo who started Blancpain in the 80s started to helm the company, it took off. Literally. Jean Claude introduced the concept of fusion...the fusion of old and new. Of various materials not normally associated with each other. Much like fusion cusine - like using Asian ingredients and spices with French classical cooking techniques to make an interesting dish. 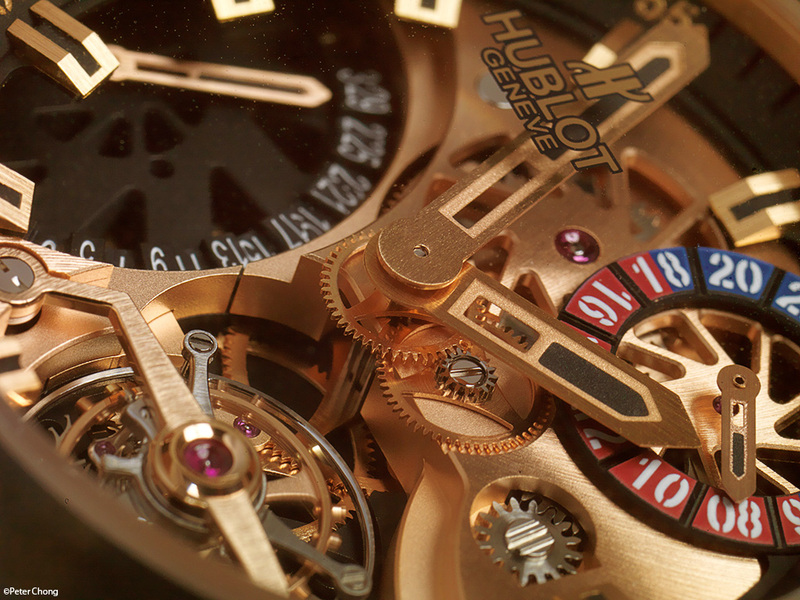 I have been following Hublot ever since Jean Claude burst into that scene. Addictively engaging, Jean Claude brings excitement and a spark of creative genius. 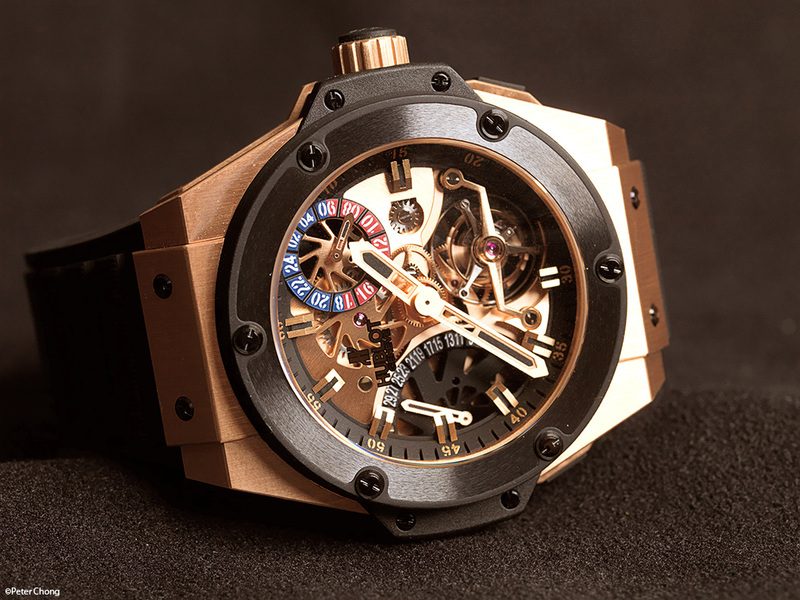 I recently had the opportunity to photograph the King Power Tourbillon in King Gold and ceramic bezel, introduced in BaselWorld 2010. King Gold is a specail alloy of gold, in 18k, but with copper. Typically copper makes 20% to provide the red hue of 5N red gold, but in this case, 24% of the alloy is copper. Platinum and silver is then added to stabilize the alloy. 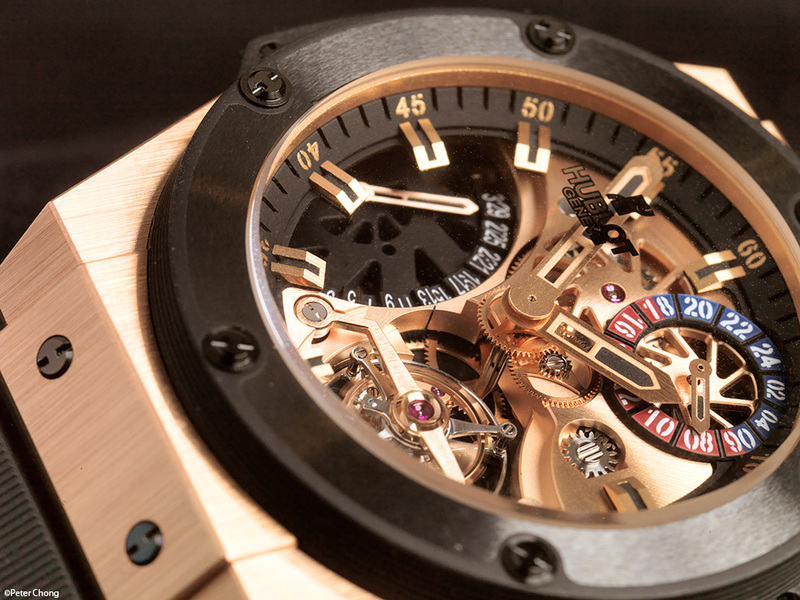 The watch also features a second timezone at about the 2 o'clock position, and retrograde date at 9 o'clock. 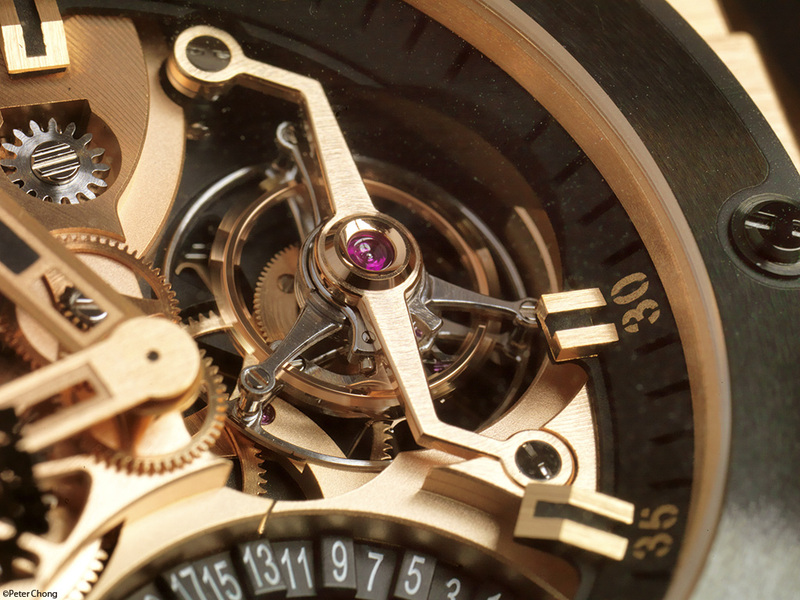 Detail showing the immense height of the hour and minute hand pivots, hovering over the dial. 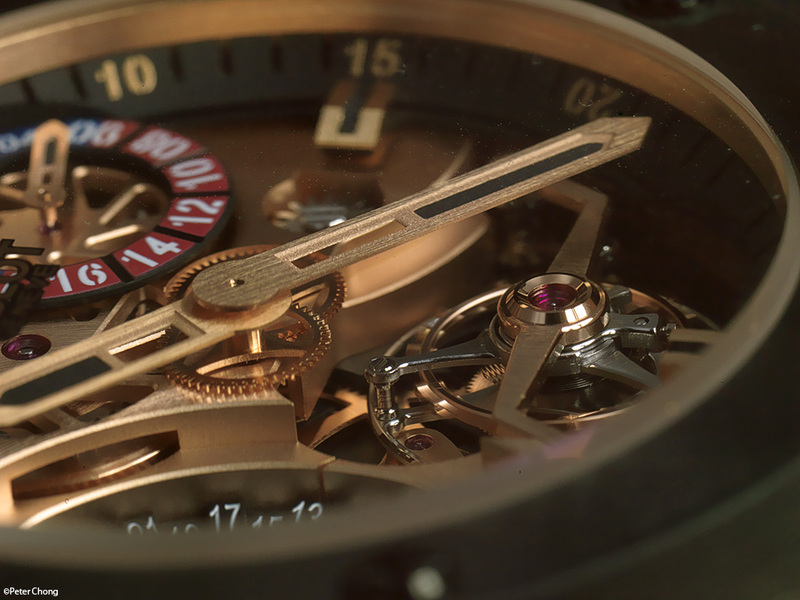 Another look at the 3D effect created by placing elements on the dial at different levels.